Becky Barker is an award-winning romance author whose work has been translated into many languages and has been made available in various formats; including, mass market paperback, ebooks, hardcover and large print library editions. She’s a die-hard romance fan who writes very sensual contemporary romances that often incorporate humor and/or suspense. 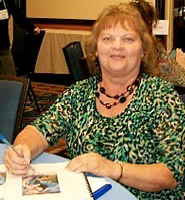 Becky invites readers to visit her website at www.BeckyBarker.com for a complete, printable copy of her backlist and to enter her monthly readers’ contest. Readers are also invited to befriend her on Facebook. On a personal level, Becky lives in small town USA with Buzz, her real-life hero and terrific father to their three children. They’re happy to share a life filled with love, laughter and romance. Becky’s a founding member and past president of the Central Ohio Fiction Writers, a longtime member of Romance Writers of America as well as a past secretary and longtime member of Novelists, Inc..
her estranged husband, Rand, thinks about it. directed at her by the ranch foreman, Curt Hayden.